This luxurious restorative hydrating facial is not only favoured by women, it is also a great facial treatment for men and is suitable for anyone concerned about aging, because it can be customized for all skin types. 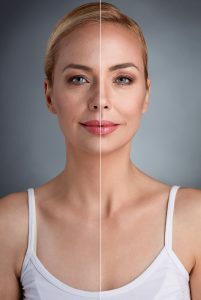 It is a deep cleansing facial that includes exfoliation, extraction and peels, and microdermabrasion, an appropriate mask, and ultrasound therapy, and more. Designed to slow down the cellular aging and a wrinkle reducer and it's a wrinkle preventing treatment, because it not only lifts the skin, it also lifts and firms the muscles, and will hydrate the skin and give you a fresh new glow. We finish the treatment with our organic human growth stem cell technology skin care products. No fluff and no hype, just visible results after one treatment. This skin care facial treatment qualifies as a non surgical facelift, but there is no downtime with this facial rejuvenation. Ladies please do not wear makeup, or wash your face or hair after the treatment. Wait until the next day and allow the products to work. Gentlemen, do not shave the day of the facial treatment. Add on an LED Light Therapy session for optimum results. Who Should Consider This Facial? Women and men who are looking to get the most out of one treatment and see impressive results. It is extremely rare that someone gets a reaction, but, as with all things, we can never guarantee that you will have not react, but I certainly only use the best products. It is just one of those unpredictable things, and it's also important to leave the skin alone after the facial and not apply any makeup until the next day.